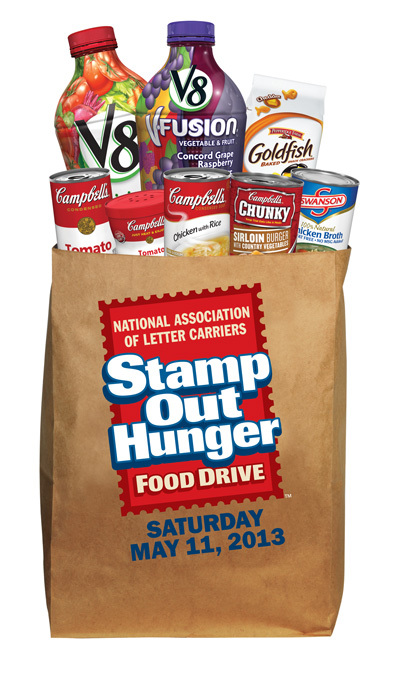 Help out your local food bank during the National Association of Letter Carriers Stamp Out Hunger Food Drive on Saturday, May 11, 2013. This is the largest food drive in the country, and it’s easy to get involved! Just leave a bag of non-perishable food where your letter carrier normally delivers your mail on Saturday, May 11, 2013. Your letter carrier will then pick up and deliver the food to a local food bank. Donate items like canned meats, fish, soup, juice and vegetables, and pasta, cereal and rice. Remember that items like condiments, spices, and treats are appreciated. Don’t include items that have expired, perishables, or food in glass containers. If you’re good at bargain hunting, you should have an ample stockpile of canned and boxed foods to donate to your local food bank. You may also want to check with your local food bank to see if they take personal care items like soap, deodorant, shampoo and toothpaste. If so, you probably have some in your stash to spare. Saving money at the store feels good. Using your savings to help others feels pretty good, too. Last year the Stamp Out Hunger Food Drive collected more than 70 million pounds of food. The need is great, it’s easy to do, and it helps so many people right in your own community.